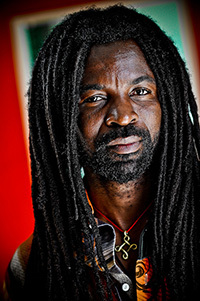 Named one of Africa’s Top 10 global stars by CNN, Ghana-raised recording artist and humanitarian Rocky Dawuni straddles the boundaries among Africa, the Caribbean and the U.S. with a progressive fusion of reggae, soul and traditional African sounds. Dawuni’s infectious grooves, dance-inducing anthems, humanitarian efforts and galvanizing performances have boosted him to the stages of the biggest reggae and world music events, where he has shared the stage with the likes of Peter Gabriel, Sharon Jones, Jason Mraz, and John Legend. Dawuni teamed with Bono for the remake of “War/No More Trouble” on the Playing for Change: Songs around the World album and accompanying videos. His songs have been featured on many TV shows, including Weeds, ER and Dexter. Dawuni is a household name in his native land, and widely considered one of Africa’s most recognized international stars.